28 MMS January 2017 mmsonline.com RAPID TRAVERSE Machining Technology in Brief Germany on a selective laser melting machine from Renishaw. After these bodies are separated via EDM from the build plate used in the additive process, they are ready for the PCD edges to be brazed on. 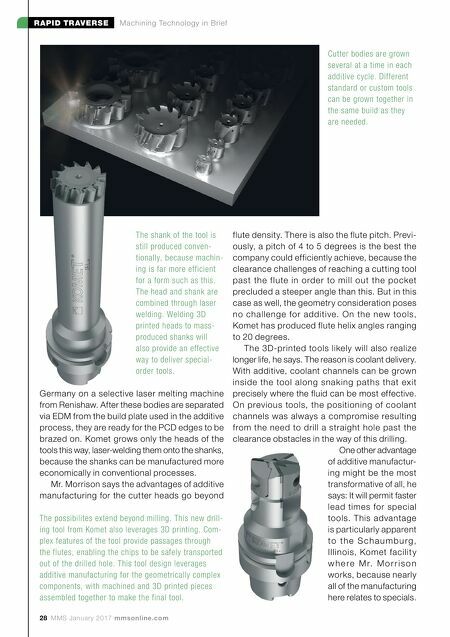 Komet grows only the heads of the tools this way, laser-welding them onto the shanks, because the shanks can be manufactured more economically in conventional processes. Mr. Morrison says the advantages of additive manufacturing for the cutter heads go beyond flute density. There is also the flute pitch. Previ- ously, a pitch of 4 to 5 degrees is the best the company could efficiently achieve, because the clearance challenges of reaching a cutting tool past the f lute in order to mill out the pocket precluded a steeper angle than this. But in this case as well, the geometry consideration poses no challenge for additive. On the new tools, Komet has produced flute helix angles ranging to 20 degrees. The 3D-printed tools likely will also realize longer life, he says. The reason is coolant delivery. With additive, coolant channels can be grown inside the tool along snaking paths that exit precisely where the fluid can be most effective. On previous tools, the positioning of coolant channels was always a compromise resulting from the need to drill a straight hole past the clearance obstacles in the way of this drilling. One other advantage of additive manufactur- ing might be the most transformative of all, he says: It will permit faster lead times for special tools. This advantage is particularly apparent to t h e S c h a u m b u r g , Illinois, Komet facilit y w h e r e M r. M o r r i s o n works, because nearly all of the manufacturing here relates to specials. Cutter bodies are grown several at a time in each additive cycle. Different standard or custom tools can be grown together in the same build as they are needed. The shank of the tool is still produced conven- tionally, because machin- ing is far more efficient for a form such as this. The head and shank are combined through laser welding. Welding 3D printed heads to mass- produced shanks will also provide an effective way to deliver special- order tools. 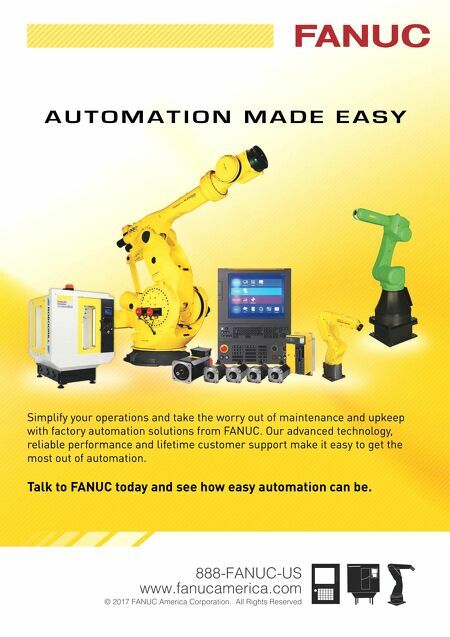 The possibilites extend beyond milling. This new drill- ing tool from Komet also leverages 3D printing. Com- plex features of the tool provide passages through the flutes, enabling the chips to be safely transported out of the drilled hole. This tool design leverages additive manufacturing for the geometrically complex components, with machined and 3D printed pieces assembled together to make the final tool.